FortySomething FirstTime Mum: Go For It! Don't Wait A Moment Longer! Go For It! Don't Wait A Moment Longer! Go For It! Don't wait! I started this blog in May 2010 when I was feeling a little lonely. I started this blog when I felt I wanted to reach out to others in the same position as me. I also started this blog to indulge my love of writing. When I put the blog out there, a friend commented that she thought I was brave to do it. She felt that she would not be able to write well enough to share her experiences with the world. I knew exactly what she meant. I felt just the same. However, I remembered John Henry Newman's quote above and decided I would go ahead with my plan. I love quotes and before sharing them regularly on my Facebook page, I collected them in a journal. These wise words have stayed with me and so, I decided, that even if my writing didn't appeal to everyone, I would forge ahead. Naturally, as is the human condition, it is inevitable that some people will find fault. However, I think that no matter what we choose to do in life there will always be people who support us and people who don't, people who agree with us and people who disagree. That's just life and the way it is. I know that now and I can accept that now. But I didn't always feel this way. I didn't always 'know' this. Just one person finding fault would have sent me on a downward spiral. A bad comment would have confirmed to me how terrible I really was. As a forty something first time mum of a now five year old boy, I have done most things later in life than many of my peers. I was in my thirties when I got married, late thirties when I learned to drive, thirty nine when I set up a small petminding business, almost forty when I learned to swim, forty one when I bought a house, forty four when I took up my yoga and blogging lifestyle and almost forty two when I became a parent! I used to put things off through lack of confidence and a belief that I wouldn't be able to cope like other people. I used to worry that people would find fault with whatever I did. I even put off motherhood through fear and lack of self esteem and self worth. Luckily for me, I woke up and got on with all the above things before it really did get too late. I learned that you cannot wait until you can do it so well that nobody could find fault. I learned that there will always be people like this and they should not hold the key to your happiness.. So I urge you, no matter what age you are, what stage of life you're at, what dream you hold dear, what you want to achieve, GO FOR IT and DON'T WAIT! Looks great!! I see that you put a twitter follow widget up there. Good job! I would move your GFC and FB boxes up in the sidebar, so more people are prone to click on those. This post is great! I love your attitude and I'm so happy that you recycled it to share with us! Thank you Adrienne. I still have a lot of tweaking to do on this blog. I haven't been putting as much time into it as I would like. Thanks for the tips! I put in the share buttons but they don't seem to work from the add this widget. I then tried pasting in the code which worked but it gives an error when I try to share. Will figure it out eventually! Thanks for the comment Verona. Like this blog,I am a work in progress. Better late than never! We are all works in progress. I love your blog and this post resonates with me. Thanks for sharing! I remember wanting to sculpt head busts and thinking it was so beyond me. The desire to do this was strong! The first sculpting workshop I attended found me with a super migrane due to fear of failure. Kept at it and took 3 workshops over the years getting better each time. Just took one the last three days and see how much progress I've made! No headaches, no thoughts of failure...pure joy knowing I kept going. The 'fear of flying' has kept many a caterpillar on the ground,never becoming the beautiful butterfly they were always meant to be. Good for you Donna. The old saying 'if at first you don't succeed,try and try again' certainly rings true here. You sound so happy that you stuck with it despite frustrations and lack of confidence. I really feel we shouldn't wait to do something we really want to do. Good advice, listening to this should get me writing more...should. I need to take my own advice too sometimes! Tee hee. Thanks for commenting Cynthia. I hopped over to your blog only to see the sad news. I'm so sorry for your loss but what a life! When I was a young adult, I thought that from 40-on was "up there" and that aspirations would be few; that it had gotten too late. But now at 55, I know that dreams can be fulfilled at any age. The joy is no less. The desires my be different, but worth it as you said. Thanks for writing this post. I need constant reminders to "go for it." I'm glad you have done so in your many goals and that you will have the courage to continue. Its true Anita. We are never too old to set another goal or fulfil another dream! As Anita said, we need constant reminders to chuck aside the naysayers and keep on going with our dreams. Your picture on our cafe blog (which is my daughter's as much as it is mine), was a nice little boost today. Thanks! I've only just spent the past hour telling myself that blogging is still worth it for me, in hopes that one day it might lead to something more, if only through the practice of writing all the time! Don't worry about the outcome. If you enjoy it, do it! I may be the oldest of your commenters but my philosophy is exactly yours: keep moving forward, trying new things, making new friends, and having new adventures. My D-I-L just had a baby at age 43, so I'm a Grammy once again. Life is never on hold, it's happening right now. I choose to be a part of the pageant! Lovely blog - I enjoyed my visit with you. I love that quote- so very true! It is still one of the scariest things I do: hitting the publish button on my blog, and that you have begun so many new things in the last several years bespeaks a whole lot of bravery on your part. Kudos! Oh we have so so so much in common. BUT you've got on with it better than me in that I still cannot drive and still cannot swim. Like the movie Sleeping With the Enemy I always tell my husband the day I learn to swim is the day I leave him. I had Aaron at 37 and will be 40 in a few days. Thank you so much for catching up on my blog today - I have some catching up to do too. This blog post is superb. Hi! I'm a new follower and found you through my friend Shelly at La Tejana. I've enjoyed this post very much and agree! I am still stumbling around trying to find a career for me in my forties, while I dabble in learning business through my etsy shop. It's sometimes more enjoyable to discover or rediscover something as we get older. Life is wonderful and enriching if we can be brave enough to learn a new skill or taste something we've never tried before. I love that you are from Ireland and I look forward to reading much more! Lord, if I waited until I could do something "perfectly", I never would have done ANYTHING with my life. And I'm old enough now that I know there are many more days behind me than there are ahead, so I don't have TIME to wait. Good, bad, or indifferent, I've gotta plow ahead and do the best I can. Super post. You go, girl! I am so aware of time passing. That has the power to depress me sometimes until I take on board that the time is going to pass anyway so I may as well do something with it! What an excellent post. Just wonderful! And I agree with you 100%. It's never too late fellow late bloomer! You are not alone in dealing with your fears. We all have them and we must all work through them. It looks like you have done a great job in facing them and pushing through. The person who never tries will never know the joys of living life to the fullest. I am well past the prime of life, but I am still up for a few more dances even though I might step on some toes. So true. We can't wait until our fears are gone to go after our dreams. The Cosby quote at the end is right. 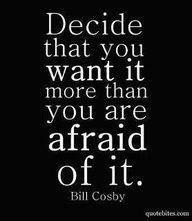 We have to want it more than we want to listen to our fears. Love your attitude and advice. You're absolutely right. We have to get out and live our lives and take risks. I can relate to the fear of putting myself out there when I started blogging too, but I found only wonderful people through the process. Keep at it! I agree Linda. I have 'met' so many lovely people through blogging. I adore reading other blogs and getting a glimpse into other lives. Hi Claire! I "officially" welcomed you on my blog today as a new follower. Thank you so much! I'm anxious to read yours and get to know you better, too. Wishing you a wonderful, blissful weekend! Interesting...you and I seem to have some things in common. I also married in my late thirties, and had my son in my early forties, and started my blog in my forties! A fellow Traveller on my journey! Thank you, thank you, thank you! I needed this...I recently quit my 'good job' to do something I felt passionate about for a change. Now I am working non-stop (for myself) and loving every single moment of it. All of a sudden, my forties are the best years of my life! Thank you for visiting my blog. I had my daughter when I was 41 and the only thing that I regret about being an older mother is that I was not able to give her a sibling. I think she would have enjoyed being a big sister. We all waste too much time worrying if we are good enough, pretty enough, smart enough. Even though I have my insecurities, it does not stop me from being the best person I can be. As you found out, your life is a journey that only you will travel. We only go around once so we should make it the adventure that we want. Yup! We all have our own journey and it's up to us to make it a good one! Good for you to start living your life at whatever age you decide to do things. Better late than never! Good post. I love your story of courage! Thank you for inspiring us all to forge onward with our lives and recognize how great life can be when we are no longer concerned about the voices of criticism. Those who cannot do something great with their own lives often have a habit of looking down or finding fault with those who do.